Ibrox Stadium is the home ground of Glaswegian football club Rangers. Originally designed by Archibald Leitch, it is regarded as one of the iconic stadiums in not only Scotland but the United Kingdom. The foundations for the modern Ibrox Stadium as we know it today were laid down between 1978-1981 when three out of four stands were completely rebuilt following a stadium disaster in 1971 during the Old Firm derby against long term rivals Celtic. Seen as the worst British Football disaster until Hillsborough in 1989, a crush amongst fans resulted in over 200 injuries and 66 deaths with Rangers F.C accepting a ruling that they were at fault for at least one of the deaths. Known then as Ibrox Park, the deaths of innocent fans held heavy on the conscious of the club but in reality, and as time would later prove in Sheffield, football stadiums across the United Kingdom were ill-equipped for spectators, essentially accidents waiting to happen. Former player turned executive Willie Waddel was tasked with reconstructing Ibrox and he travelled to the 1974 World Cup in Germany, citing Borussia Dortmund’s Westfalenstadion as the ideal template to follow. With only the original main stand deemed suitable to current requirements, the other three were demolished and converted to all seating which at the time was seen as a very adventurous move. The Taylor Report published in 1990 essentially vindicated the Scottish club’s first hand evidence that stadiums were unsafe although the club did retain a small amount of terracing within the one remaining Bill Struth stand. Funded by Rangers football pools operation which was the largest club run scheme in Britain, £6 million pounds was raised and although costs spiralled to £10,00 the club were on an upward trajectory with season tickets sales rising from 7,000 to 30,000 in the 1990s. Eventually the other stadiums in Glasgow caught up with Celtic Park exceeding Ibrox’s capacity which prompted Rangers to investigate the feasibility of expansion but the plans for to reach 57,000 thousand were thwarted by the Global financial crisis and more recently, the club’s administration. 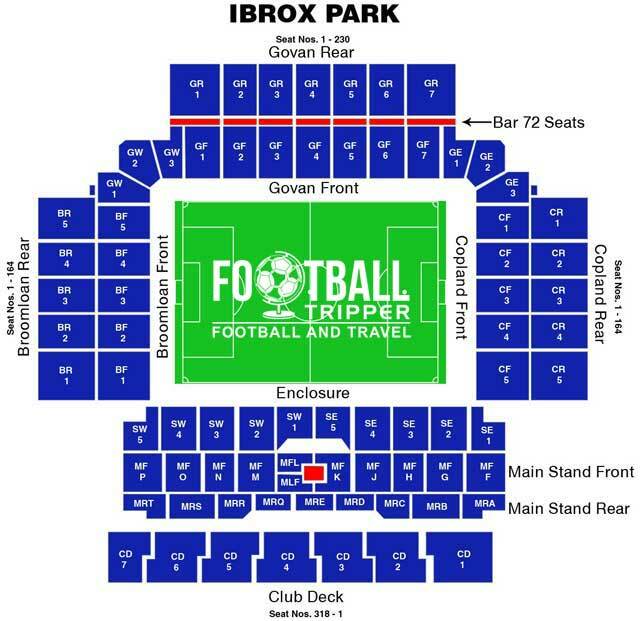 Ibrox Park is comprised of four stands: Govan (North), Copland (East), Bill Struth Main Stand and Broomloan Rear (West). One of the best places to drink at the ground is at The Ibrox Bar which is located in the Ibrox Suite next to the Rangers Megastore. Open up to 2 and a half hours before kick-off and for 2 hours after the full time whistle, it has a great atmosphere on matchdays and a well-stocked bar with decent service. There are plenty of food kiosks located within the concourses at the stadium, with all of them selling the expected range of football grub including pies, hot-dogs, burgers and drinks. Within the family section there is even a meal deal for children which include a snack, drink and collectible player card which is a nice touch by Rangers. Rangers operate a club shop at Ibrox Stadium between the Govan and Copland Stands and one at Glasgow Airport in addition to their own Online Megastore. The stores are also open for up to 30 minutes after the end of the full-time whistle. How the Ibrox megastore looks like. Stadium tours of the facilities at Ibrox usually run every Friday, Saturday and Sunday and cover such hallowed areas as the home dressing room, the trophy room and the manager’s dug-outs. To find out more information regarding times available or to book a tour you can either phone the club on 0871 702 1972 or visit this page. Tickets to see Rangers in action can be purchased via the usual channels including telephone 0871 702 1972 (option 1), in person at the Ticket Center which is open Monday to Friday 9.00 am – 5.00 pm or online via the club’s ticket booking page. A picture of the iconic architecture at Ibrox. The club offers some spaces to fans within the Albion Car Park which is located opposite the stadium. Priced at £7.00 per vehicle, you can either book in advance by phoning 0871 702 1972 or visiting the Ticket Centre, or pay on the day – assuming that there is enough room when you arrive. Make sure that you get there up to 90 minutes before kick-off as the area becomes pedestrianised before kick-off. Glasgow Central is the main railway station of the city, and is for many visitors across both Scotland and England the main gateway into the city. When it comes to travelling to Rangers Stadium however, there isn’t a suitable train service you can take unless you regards the subway system as a train. Rated by the club as the most convenient way to get to the stadium, catching the subway from the city centre takes anywhere between 10-15 minutes depending on the number of stops, with the resulting walk less than two minutes away. The Ibrox Subway station, the easiest way to get to the ground on matchday. From the centre of Glasgow you can catch the Subway from both the main train stations of the city, Queen Street and Central, with the name of the subway stops being Buchanan Street and St.Enoch respectively. Predictably it gets very busy during and after the game, and some fans recommend getting on at Cessnock Underground Station located on Paisley Road West which is usually less congested. For further information and timetables please visit The SPT Website. There are quite a few bus routes you can take, however with the Subway a match made in heaven for fans travelling to Ibrox, it’s unlikely that you’ll wish to use this form of transport. The First Group Website can help you plan your journey by bus. The closest hotel to Ibrox Stadium is The Premier Inn which is located on Pacific Quay next to Glasgow Science Centre and the headquarters of BBC Scotland. The remaining choices such as Hotel Ibis, Travelodge and Holiday Inn Express are all located back towards the city centre.